To download - load the rolla How To pdf then choose file—>save page as. Each B4 is set up with low to medium action at the workshop. If you decide to adjust your action at the bridge point, simply follow these steps to dial in your string arch as you wish. Each string has its own independent through the body bridge. To adjust your bridge action take your supplied 5/64 allen driver. 4. Adjust each one as simultaneously as possible while keeping an eye on the bridge so it is level. 5. After all your heights are set snug up all the screws. Each string has its own individual through the body bridge. VIEW OF INDIVIDUAL BELL BRASS NICKLE PLATED BRIDGES WITHOUT THE ASHTRAY COVER. TO LOCK DOWN YOUR FINE TUNER, USE THE 5/64 ALLEN DRIVER FROM YOUR TOOL KIT. THIS STEP IS DONE AFTER YOU ARE FULLY INTONATED. TURN CLOCKWISE TO JUST SNUG UP THE SCREW. DO NOT OVER TIGHTEN. TO ADJUST THE FINE TUNER, TAKE YOUR 5/64 ALLEN DRIVER AND POSITION THE BALL HOOK A LITTLE OVER HALFWAY BETWEEN ITS ADJUSTMENT. TO ADJUST YOUR INTONATION, IF YOU DECIDE TO CHANGE TO A LARGER STRING GAUGE: TAKE YOUR 5/64 ALLEN DRIVER AND SLIGHTLY LOOSEN THE SCREW, SO THE INTONATOR CAN SLIDE. THEN, WHEN YOUʼRE DEAD ON PITCH, TIGHTEN THE SCREW NICE AND SNUG, SO IT WONʼT RATTLE WHEN YOU THOMP ON IT. This is the front of the bridge adjustment screw. It presses on the inside of the bridge plate and forces the front to raise. This is the back screw - it forces the back of the bridge to raise. Notice the back screw is fed from the outside (right) and the front screw is fed from the inside (left). 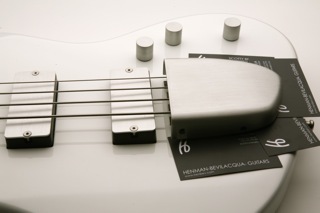 The bridge plate acts as a force plate to counteract the adjustment and allows the player to separately adjust the action of each string. Trussbar and headstock separate from the neck and nut mount. SAVE YOUR SCREWS IN CASE YOU DECIDE TO REPLACE THEM. As part of our design that we love so much, we have our own custom bridge covers machined from a solid block of 6061 aluminum. They are designed to fit tightly onto the two end bridges. The two reasons you would have to remove your ashtray are: To change the strings, or you choose not to have it on at all. Generally, most players that “palm rest” their right hand while playing decide to remove the cover. Those that “thumb rest” their right hand, leave it in place. To remove it, please follow these step by step instructions very carefully to prevent any damage to the finish of your ROLLA. The cover fits over the bridges very snugly to prevent unwanted vibrations. Feel free to call for guidance if you’re having any trouble. 760-277-8781. Place a layer that has a ‘no scratch’ surface, like business cards, and lay them under and around the raised bridge sections to protect the finish. TAKE YOUR 1/16 ALLEN DRIVER OUT OF YOUR TOOL KIT AND UNSCREW THE 4 SCREWS. PLACE THESE IN A SMALL ZIP LOCK BAG ALONG WITH YOUR ASH TRAY IN CASE YOU CHOOSE TO REPLACE THE COVER. Carefully use your fingers and try to get underneath to get a grip. Use your thumbs for support. Here is the MOST IMPORTANT step. Since the cover is on snugly, you may have to wiggle it back and forth while at the same time pulling up. DO NOT LET THE ASHTRAY EVER TOUCH THE PROTECTIVE LAYER (BUSINES CARDS). IF YOU DO TOUCH DOWN ON THE SURFACE, DO NOT PRY ON IT. Take off as level as possible, while taking a deep breath and taking your time. Gently pull up while making sure you have a good hold onto it. Wrap up your ashtray in a soft cloth, place it in a bag along with the screws and store it in case you decide to put it back on at a later date. Place a layer that has a ‘no scratch’ surface, like business cards and lay them under and around the raised bridges to protect the finish. LINE UP THE FRONT EDGE OF THE COVER TO THE FRONT EDGE OF THE BRIDGE. START WITH THE BACK AND SLOWLY PRESS DOWN. WHILE KEEPING BOTH HANDS ON THE COVER, WIGGLE IT INTO PLACE. PRESS DOWN WHILE LOOKING INTO THE SCREW HOLE AND LINE IT UP WITH THE HOLE IN THE SIDE OF THE BRIDGE. GET IT AS CLOSE AS YOU CAN WITH YOUR EYE. MAKE SURE NOT TO TO TOUCH THE PROTECTIVE LAYER. WITH YOUR 1/16 ALLEN DRIVER LINE UP THE FRONT HOLE FIRST. INSERT LONGER SCREW. IT SHOULD GO IN EASY. IF NOT, STOP AND MAKE SURE YOUʼRE GOING IN STRAIGHT TO THE TAPPED HOLE IN THE BRIDGE. DO NOT OVER TIGHTEN. ALIGN THE BACK SCREW HOLE AND INSERT SMALLER SCREW AND REPEAT ON THE OTHER SIDE. INSERT YOUR BACK SMALLER SCREW. TO GET ALL FOUR SCREWS TO LINE UP, ITʼS BETTER TO LEAVE THEM ALL A LITTLE LOOSE UNTIL YOU GET THEM ALL MOST OF THE WAY IN. THEN YOU CAN ADJUST IT INTO THE EXACT POSITION. FINALLY, JUST SNUG THEM UP.